Today is Blogging Against Disablism Day, and our need to fight against disablism is registered in part (if only in small part) by the fact that we don’t rightly know what to call it. We’re talking about discrimination against people with disabilities, of course, but some people call this form of discrimination “ableism,” optional comma, and some call it “disablism.” This is actually not a trivial matter; rather, it’s a trivial index of a very serious problem, namely, that discrimination against people with disabilities is not really part of the public lexicon, because it’s not an important part of public consciousness or public policy. That’s why someone like David Frum can write something like this . . .
Conservatives, however, see the things they dislike in the contemporary world—abortion, the slippage of educational standards, foreign policy weakness, federal aid to handicapped schoolchildren—as all connected, as expressions of a single creed, a creed of which liberalism is just one manifestation. This passage cracked me up. (Belle was moved to inquire solicitiously: “Are you OK, honey?”) It is, of course, precisely because people know some conservatives see all these things as connected that some people think some conservatives are bats. . . . Seriously, here’s a cautionary lesson taught by the 1960’s (you’d think conservatives could learn such things): just because you feel that everything is, like, so connected in a mysterious way, doesn’t make it so. And for damn sure you don’t have the right to bother other people with constant reports of your weird but strong intuitions of, like, total interconnectedness. It almost makes me feel sorry for neo-cons: trying to hold decent seminars on foreign-policy—US military posture in the Middle East, etc. ,etc. ; always having to step on the conservative faithful to keep them from breaking in with ‘deeply-connected’ tirades against wheelchair-ramps in schools. Tinfoil hat stuff. Yeesh. It’s true that Frum sometimes writes and thinks as if he’s taken a monster hit from the Axis of Evil Bong, yes. But can we spare a word specifically for the claim that conservatives dislike abortion and federal aid to “handicapped children”? Bèrubè’s [sic] cardboard cutout pro-life politician denies rights to living persons. One wonders who does this. Who are these people? He calls the implications of holding that humans have a right to life “only until they’re born” staggering, and this would be true if anybody held to that view. But I can’t think of a single pro-lifer who does, certainly not to judge from the literature I received from a number of pro-life groups. Conservatives are hereby invited to repudiate David Frum and support the rights of “handicapped children,” beginning with their right to a “free and appropriate public education in the least restrictive environment,” in the words of the Individuals with Disabilities Education Act. Repudiate David Frum anytime you like, good people! Blog operators will be standing by night and day. And now it’s time for a Jamie story. But first, a little prefatory remark about these Jamie stories. Most of them, you’ve noticed (if you’re familiar with the genre), make the point that Jamie is really quite bright in ways most people don’t ordinarily associate with Down syndrome (and boy, do I have a cool update waiting in the wings); a couple of posts have chronicled Jamie’s remarkable improvement as an athlete. I write the “Jamie is quite bright” posts not only to show that Jamie is quite bright, of course, but also to try (as best I can on a humble blog) to change the public perception of children with Down syndrome in general—and to make the ancillary case that Jamie’s talents owe something to the programs of “early intervention” that he (and we) were lucky enough to enjoy more than ten years ago. For it should be clear—and I’m a-lookin’ right into your shriveled, blackened heart, Mr. Frum—that a Jamie without rights and without state aid wouldn’t quite be the Jamie we know and love today. And yet our love for him isn’t contingent on any of his accomplishments. Even if he weren’t smart enough to do two-digit multiplication almost as quickly as any nondisabled child, we would still love him. Even if he weren’t coordinated enough to smack line drives on both his at-bats in Challenger League baseball this past Friday evening (against his father’s overhand pitching, no less), we would still love him. And even if he weren’t so thoughtful as to remind me that I could put an ice pack on my aching lower back while driving to Giant for the groceries he so badly wanted to buy yesterday morning, we would still love him. Just so that’s clear. And now for the story, which has to do with how Jamie has grappled with one of his disabilities. I’ve mentioned before that he has trouble with some forms of abstract thought. And what’s more abstract than time? Only four or five humans now alive understand it, though interestingly enough, one of them has a pretty significant disability. When Jamie was ten or so, he began to use temporal markers in his speech, though he had no idea how to use them: he would tell you that he rode a horse maybe six years ago when in fact it was last Tuesday, and he would say “I did that yesterday” when in fact he did it when he was three. Gradually, over the years, his awareness of “years” has gotten sharper and sharper, partly as a result of the Beatles, whose career he tracks year by year, and partly as a result of his ability to create cross-referenced lists: he now keeps a list of all the states I have visited and the years in which I visited them. Until just this year, he would reference 1998 as “when I was seven,” because he wouldn’t quite accept the notion that he wasn’t seven until September 16, 1998; as far as he could see, he was born in 1991 and was therefore seven in 1998. But lately he’s come around on this important timekeeping issue, and assents to the proposition that when he went to the National Down Syndrome Society conference in Wisconsin in July 1998 he was still six years old. About smaller chunks of time, like hours and minutes, he was clueless for a long time. Again, why shouldn’t he be? It’s not like hours and minutes come naturally, after all. But one day three summers ago, after we’d finished our weekend swim and were toweling off in the locker room, Jamie said, “and now we will get lunch and go to the movies and play mini-golf and buy groceries and”—and I told him we couldn’t do all those things. He asked why. I said we didn’t have enough time. He asked why. I said we only had four hours before dinner, and that we could either (a) have lunch and see a movie or (b) have lunch and do all the other things, but not both. He asked why. So I sat him down, took a deep breath, and said, “OK, listen. You are so clever about sharks, and you know all the states, and you have such a great memory.” “Hmm,” Jamie hmmed in agreement. Jamie was uncharacteristically quiet for a while, and I was afraid I’d been a bit too harsh. I’d spoken as if I were his coach: you need to work on your backchecking—you don’t pick up your man in our zone, and you’re hurting the team. And I certainly didn’t want him to get discouraged about understanding time. But over time, I discovered that Jamie had taken my admonition to heart. We got him a digital watch, and he was diligent about wearing it and referring to it eighty or ninety times a day. By the time he got to middle school, with its unfathomable twenty-three minute intervals and forty-eight minute periods rotating on a six-day schedule (I kid you not), he was all set. There was only one thing left: intermediate intervals of time, neither hours nor years but weeks and months. Jamie was now old enough to understand durations of moderate length (as in, “you will turn twelve in three months”), but hadn’t yet integrated them into his lexicon, as he had done with minutes and hours and years. And then came the tent. What tent? Why, the tent I got him for Christmas in 2002. That tent. You probably didn’t figure me for the tent-getting type. In fact, if you happened to know that at the time I bought the thing I’d never set up or slept in a tent in my life, you’d probably ask the same question Janet asked as we wheeled it out of Target: what the hell did you do that for? (Which was soon followed by “who’s going to set that up” and “who’s going to sleep in it,” and other related questions.) “I think Jamie will like it,” I said, having, of course, no other plausible reply. Well, guess what? Jamie loved it. We kept it in its box for most of summer 2003, but one morning in July we handed it off to his camp counselors at the local YMCA, and they set it up: because Jamie now had a tent, he could finally go on the annual camping trip from which he’d had to stay back in 2001 and 2002. Every year, you see, the Y camp goes to Black Moshannon State Park, and all the kids and counselors swim and play games and eat dinner and roast marshmallows and sing songs and do that whole camping-and-campfire thing. I agreed to meet Jamie at 8 pm that evening and camp out with him for the night; the Y staff had put up everyone’s tents earlier in the afternoon. I slept on an air mattress, and Jamie slept on a sleeping bag. It was a Real Adventure. Jamie’s first night in a tent—and my first night in a tent. Jamie was 11; I was 41. It was chilly and rainy, and I don’t think I got more than four hours of sleep, but Jamie was hooked. From that point on, the tent induced in Jamie the full-body, hunched-over, hand-rubbing glee with which he expresses his love for his very favorite things. We were persuaded to set up the tent in our backyard a couple of times that August, and we even got a second air mattress for Jamie’s extra added bonus sleeping comfort. But Nick wasn’t into it (he camped out with Jamie once), and Janet said she couldn’t sleep on the air mattress (she tried it once). So that left, by the inexorable process of elimination, me. Appropriately enough, since the tent was my dang idea in the first place. Jamie and I made a little routine of our backyard camping. We’d get the air mattresses and bedding ready in the late afternoon, and then after nightfall we’d trek outside with our lanterns and a couple of cans of seltzer and a packet of Capri-Sun and Harry Potter and the Order of the Phoenix. Jamie would be asleep by ten. I would be asleep by 10:15 and then awake at 1 and then asleep again at 3 and then awake at 4 and. . . . And we’d wake up between six and seven and talk about all the animals that were waking up with the dawn, and then we’d pack up and head back to the house, where Jamie could watch morning TV and I could get some sleep. “March!” Jamie said, knowing full well when spring officially begins. “Well, not March,” I replied, knowing full well how long a central Pennsylvania winter can hang around. “Or maybe May,” Jamie offered. “May is good, yes,” I said. “In May it’s usually warm enough to sleep outside at night.” I was thinking of late May, when the nighttime temp usually stays over 50, and (just as important) when I’m not teaching. But I didn’t say that at the time. “Did you tell him you would set up the tent today?” Janet asked quizzically. Well, you could say he’d learned a thing or two about time. And so, on this May 1, for Blogging Against Disablism Day, I offer this little tribute to Jamie: to his sense of adventure, to his patience, and to his impeccable timing. So, did you or did you not camp out on the night of May 1, 2004? I don’t know if this sapphire bullet of love can reach David Frum’s cardiac charcoal briquette, but it sure has done a number on mine. Wow. Just wow. Which already implies that Frum believes that “federal aid to handicapped schoolchildren” should be replaced by state or local aid, charity, or nothing. But further down (and still above that paragraph), Frum waxes rhapsodic about the virtues of character of the people in the Donner Party, and asks where those people went. ("Into each other, to a dismaying extent”, as Holbo says.) Once you’ve read a paean to cannibalism as revealing the moral virtue created by forcing people to live without a safety net, it’s easy to miss commenting specifically on lack of “federal aid to handicapped schoolchildren”. I’m afraid I’m with Janet as far as sleeping on the ground goes, but my daughter’s dad is a camping pro. No, I didn’t really say that. I said, “it’s May, yes, but it’s still pretty cold at night.” The next weekend was no better. The next weekend Jamie and I drove down to Virginia Beach to my father’s retirement party. The next weekend he and Janet and I went to New York (I had an MLA meeting). The next weekend I was at the American Literature Association conference. So Jamie, kind soul, waited until June for his first backyard camping trip in 2004. I honestly mean the soon thing, but soon also never really seems to materialize. He doesn’t call me on it either, probably because he doesn’t have a firm grasp of how many gallons are in a soon. Ah, but you are neglecting the Wingnut Desensitization Effect. Once you’ve read as far into a wingnut tract as Holbo did by the time he got to that paragraph, it’s pretty much impossible to bat an eyelash. My theory, not that you asked, is that the Wingnut Desensitization Effect is the result of a deliberate rhetorical and political strategy. Just as ICBMs are programmed to release radar-confounding objects as they streak toward their targets, rendering radar useless because it picks up practically everything in the sky as a “missile,” so too do wingnuts deliver themselves of billions of batshit insane propositions at once, confounding sensible liberals who only have so much time and energy to address and rebut the most lethal weapons in the massive wingnut arsenal. We need a Progressive Strategic Defense Initiative is what I’m saying. Since I don’t have a blog, for my Commenting Against Disablism Day task I went over to the Harvard Implicit Association site and did the task to see how they rated my implicit associations around disabled/abled (their terms) people. Sorry, I don’t know how to make the linky thing happen. Later I will go back to read some of the stuff on the neurodiversity.com site. You know, there are little throw tents you could probably set up in his room. That way, he could camp all year long. And you could sleep. Also, I recall “camping” as a child was mostly throwing an old blanket over the kitchen table. Until just this year, he would reference 1998 as “when I was seven,” because he wouldn’t quite accept the notion that he wasn’t seven until September 16, 1998; as far as he could see, he was born in 1991 and was therefore seven in 1998. I do this all the time. Why don’t you ever take me camping? I do it all the time too, Scott. I think it’s a tough habit to break, particularly for those of us born toward the end of the year. I’d spoken as if I were his coach: you need to work on your backchecking—you don’t pick up your man in our zone, and you’re hurting the team. It has been my experience as a goalie that nearly everyone could use work on their backchecking, so I’d be in favor of everyone getting this advice (even if they don’t play hockey, y’know, just in case...). My captcha word is “anti”. Does that mean I need to come out against something? One of these years i will successfully lobby the Oregon Country Faire spoken word promoter to bring the Bérubé clan to the fair. It is an event that promotes inclusion in every possible way (which takes a great deal of effort given that it is held in a wonderful magical forest on dirt trails and grass). The real breakthrough for me came when the performance artists (many vaudeville styled acts and jugglers) began to transcribe their physical performance in braille. Now the blind may choose to use one of the notebooks that are made available at each show to visualize the movements for which they hear the performers. This extended the efforts that have for years included all manner of accomodations and complete access to all that reaches into the communities and cities in the region beginning with free bus rides to the daily events. One of the odd benefits has been that people who have learned to watch out for, and help others, are now more cognizant and aware--and thus more careful around the dozens of stiltwalkers, too (they add so much to magic). **#3-- update on the Donner Party--well some of them went on to own large orchards in the Sierra foothills; where they continue to be ardent proponents of: private property rights and not paying taxes; xenophobia but willing to hire immigrant farm labor and not pay union wages; and use of horrible pesticides, herbicides and fertilizers (making life difficult for the surrounding organic farms). Seems somehow they achieved the very state of consciousness that Frum desired (he could visit their family’s museum). Marita, that’s insanely on the spot. My birthday’s December 23rd. Now, if only you had an equally rational explanation for why I can’t remember how many years ago I graduated from high school or how old my wife is . . .
Michael, you and Jamie and other family members who care to are welcome to come visit any February for a Mojave camping trip. It still gets cold at night. But it’s a dry cold. Wow, I just discovered that we were at the same conference, ALA 2004 in SF. I was on a roundtable about working-class literature (on the last morning of the conference, which meant, of course, that really no one was there) and I also filled in at the last minute for a no-show on a panel sponsored by the E.E. Cummings society (thank god for having versions of papers saved in email). Unfortunately back then I was but a lowly first-year and not yet aware of the presence of a dangeral studies academostar. Now I have to go check the conference packet to see if we went up against each other (perhaps to find a reason for the painful lack of attendance at my panels). I meant to disrespect to wheelchair ramps, Michael. It was really the wheelchair ramps/foreign policy axis of mutually reinforcing significance that got to me. In the redacted quote of Frum nowhere does he say “I” or “we”; he refers to “conservatives” in the third, so how do you infer that this is Frum’s point of view? But, more importantly, who would say that Frum speaks for more than a small group of neo-conservatives who are primarily concerned with U.S. strategic foreign policy? Conservatives hold up a big tent, why they even let an imposter like Geroge Bush crawl in. And of disingenuousness, isn’t it very much so to take a swipe at National Review on the matter of the disabled without mentioning that for the past 2 weeks many over there have been discussing nothing more than Ramesh Ponnuru’s “The Party of Death”, a book I haven’t read yet, but intend to, and one maybe you should read too, for I hear that it makes some dismal assesments of the culture of the American left regarding the disabled. And thus Daniel neatly encapsulates the Conservative Literacy Project in 32 words. Conservatives hold up a big tent? Let’s all go camping! It’’s a cold day in hell already? I meant no disrespect to wheelchair ramps, Michael. It was really the wheelchair ramps/foreign policy axis of mutually reinforcing significance that got to me. No worries, John. I got that. It’s Frum’s “the state owns your uterus but will not help your child with disabilities” bit that I’m after. But honestly, Michael, these Jamie posts are starting to make me feel a wee bit inadequate in the daddying department. Venerable Ed, old man, don’t forget the part where Jamie watches a couple of hours of weekend morning TV while Dad snoozes on the living room couch. An essential component of any daddying department. I guess I have more time to think about her work now that Rangers have exited from the playoffs. 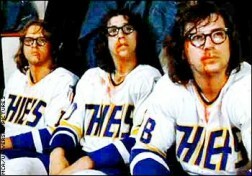 And it is my experience as a forward, Marita, that if forwards were meant to backcheck, they’d all be named Bob Gainey. You goaltenders take care of your job, and I’ll take care of mine. Yeesh. Not a chance, Rox. He’s all about the real outdoors, or at least as much of it as our backyard can offer. One of these years i will successfully lobby the Oregon Country Faire spoken word promoter to bring the Bérubé clan to the fair. Cool! We’re there. Jamie would love it. That’s OK, Chris! We’re content to read about such things on blogs. Our favorite blogs! I was on a panel with about eighteen other people, Jon, and we were talking about White Noise. We each got thirty seconds to speak. It was great. In the redacted quote of Frum nowhere does he say “I” or “we”; he refers to “conservatives” in the third, so how do you infer that this is Frum’s point of view? I hate to sound all teacherly about this, but: it helps to read the book. I’m sorry, did someone on some blog somewhere mention the National Review? We were talking about a book called Dead Right, last I checked. Oh good! I hope it goes after those evil Dhimmocrats like Tom Harkin and Teddy Kennedy. They hate the disabled. I grew up in the west and so have done a lot of camping in my life. I was always uncomfortable at night until I got a Thermarest mattress. I sleep as well on a Thermarest as I do in my bed at home. I love your stories about Jamie. perhaps the filthy lying Democrats (who have been expressing their will to power these last six tragic years) could rebrand themselves as the Death American Party. 2) makes me think of “Death to America,” which I yell during the physical act of love. I hope this helps, Daniel. I’m currently wearing rainbow-colored pajamas. Good stuff as always. As you know, those inclusion and least restrictive environment issues are close to my heart. BTW, I just accepted my first teaching job in Lander, WY - 9th and 10th Language Arts, plus… yearbook! You and Jamie are welcome to join me for the Pinedale to Lander trek across the Wind River Mountains this summer. Wings in sev… nevermind. Uh, go Tigers. I’m with Venerable Ed. Michael, your parenting skills make me feel merely adequate. I LOVE the idea of you, a total non-camper, walking out of the store with a tent just because your son might like it, and then actually using the darned thing. Now I must hie myself to REI! Michael, as long as your tent adventures are confined to the backyard and other such tame spots, your first imperative is to ditch the air mattresses. Those things are awful, and bring back memories of early, uncomfortable experiences with my wonderful, camping-challenged parents. I hate to say it, but you should visit Wal-Mart or a similar big box; get a couple of those 3” foam pads made for RV Kamping. That alone should double your actual sleeping time in the tent. Hattie, Thermarests are indeed great and I swear by mine, but they’re still Spartan by backyard standards, being intended for real camping. If we ever actually get Michael and Jamie out here for the Oregon Country Fair a short, easy backpacking side-trip might be in order; I can muster plenty of spare gear. I suspect that Jamie would love backpacking to death… but that might be a most unwelcome can of squirmies for his dad. This post is great. I tried yesterday to think of a more interesting way to say that, to no avail, but I mean that emphatically even as I state it boringly. As a teenager I babysat a lot for a boy who had Down’s Syndrome. He is 27 now, has his own landscaping business, and seems pretty happy with his life whenever I catch up with him. He has great parents, too, which never hurts. Joanne 8—I went to the Harvard site and tested my Implicit Associations for disability, but apparently their test can’t calibrate answers from folks with learning disabilities (my answers were rejected as too slow or too wrong). So I guess I’ll never know <g>. Captcha: all, as in you can’t accomodate all the people all the time. I loved this post, and the story--thanks! People should support the rights of “handicapped children,” beginning with their right to a “free and appropriate public education in the least restrictive environment”. That was a wonderful story. Reading posts like this one make me want to be a parent. And if you knew me, Michael, you would take that as quite a compliment. Rumour has it that David Frum might be considering a return to Canada now that we have a new conservative government. This is what we all fear. How much money would you require to keep him? We are prepared to pay in the high two figures.